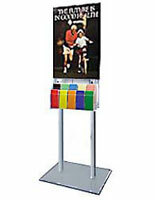 Acrylic Poster Frame Has Literature Attachment! 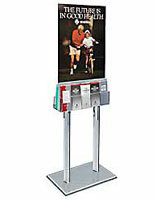 Fixture Accents Retail Spaces, Public Venues and More! 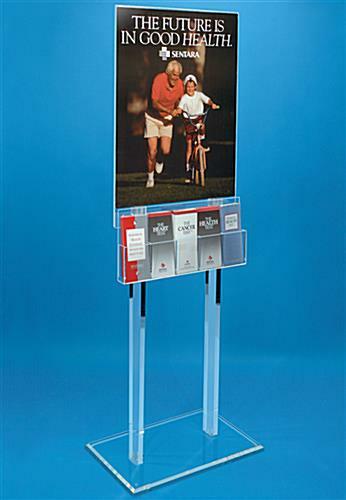 Poster Frames - This poster frame with a poster stand and literature rack is one of our most popular displays! 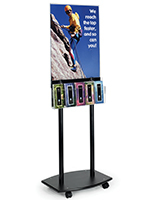 This display is 67" tall and holds two 22"w x 28"h posters for double sided viewing. 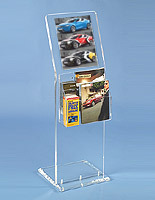 5- pocket brochure holder attachment on one side with adjustable dividers. 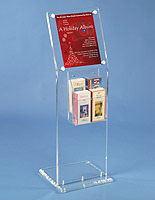 The pocket rack can be configured anytime for standard 4" wide brochures or 8.5" wide literature. Easy assembly, all hardware provided for this poster holder. 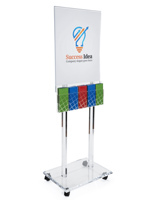 Base measures 24" wide by 18" deep. We love our new sign. 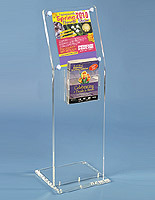 It's sturdy, and very professional looking. We're very pleased with how it looks in our lobby! Your sign looks AWESOME, Heather! Thanks so much for the review and for showing this beauty off!